Welcome to Averack beside-the-sea! This split level family home really is the perfect coastal escape offering panoramic sea views and a beautiful established garden. 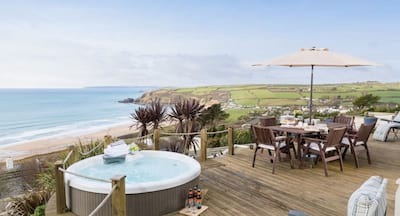 Located in Praa Sands in the heart of West Cornwall, discover the golden sand beaches and iconic Cornish scenery of this stunning coastline from Penzance to Porthleven. Averack offers 4 bedrooms set over 2 floors, 3 bathrooms and the perfect layout of living space for relaxed holiday life. To the front of the house is a large terrace with additional lower terrace and lawned garden. Parking for 3 cars. The beach at Praa Sands is a short walk away. Upon arrival, the sense of coastal style and sea views from every turn set the scene for your relaxed holiday with friends and family. A welcome boot room come storage area is perfect for all of your holiday kit from wellingtons to windbreaks and is locacted just off the kitchen. Step down into the fully fitted kitchen which offers double doors out to the garden. Soak up the sea views as you prepare supper, the breakfast bar is the perfect place for children to dine earlier whilst you get creative. Lead through into the open plan living and dining space, this really is the hub to the house with a wonderful sense of natural light. In the cooler months, gather as a group beside the fire or throw open the double doors to the terrace for the ultimate inside outside ambience. Ample seating ensures everyone can relax as holiday conversation flows, the large conservatory area offers a quiet corner to sit and watch the boats go by in the bay. The dining table is set within the conservatory, a versatile space for a morning coffee or lazy lunches. A separate snug and TV room offers a welcome escape for children, a large space with corner sofa and extensive collection of novels and games for all ages. To the rear of the ground floor are 2 spacious bedrooms and large family bathroom. A central staircase leads to the first floor with 2 sea view bedrooms each with a wonderful juliet balcony opening out towards the stunning seascapes. A further shower room completes the top floor. Averack oozes coastal charm, think maritime artefacts, coastal themed soft furnishings and nautical inspired artwork. Rest, relaxation and rejuvenation are the order of the day! The extensive gardens of Averack make this a first choice home for larger families with children. To the rear is a gently sloping lawn leading from the parking area to the front door. A large terrace wraps around the house, to the front the elevated position ensures panoramic views of the blue bay and Praa Sands beach below. A wooden dining table and smart olive green directors chairs invite you to dine alfresco in style or simply sit back on the garden bench with a good book. Steps and pathways lead to the lower level with additional sheltered seating area with all weather relaxed sofa style seating and garden parasol. A lush green lawn is perfect for children to safely play. The established garden brims with life year round with pretty pink Daisies and Camelias offering bursts of colour from Spring. The golden sand beach of Praa Sands welcomes surfers and beachgoers alike, enjoy an evening meal at The Sand Bar with it's relaxed surf vibe. Further along the coastline, Porthleven offers a tempting choice of places to eat from simple fish suppers, chips on the quay or more fine dining options. 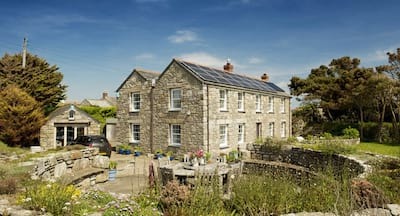 Whether your days are spent out and about exploring Cornwall or Averack has become home from home, enjoy this quieter corner of Cornwall in all seasons. Averack is an excellent property, with an amazing garden and views looking out to sea. It is also really well decorated. I would recommend it to anyone who is looking for a relaxing break! Very comfortable property with spectacular views and everything you could possibly need. Averack is the best house we have rented for a holiday. It is spacious, comfortable and ideal for a family. The view from the living area is fantastic. What was most striking was that whatever the most obscure requirement you might have while on holiday, Averack covered it. The facilities were remarkable. When it came to books, CDs and DVDs the selections covered a wide range of tastes so there was something for everyone. A great house. We may well be back next year! We loved the property, if only the weather had been better!! The property is first class and as having a second lounge and lawn that children could use is a real plus.